The SF-24 is a phantom-powered version of the SF-12. Both are dual-ribbon stereo microphones with an onboard XLR5 connector, which is split via included jumper cable into two standard XLRM connectors. Unlike dynamic ribbon designs, the SF-24 is not sensitive to input loading or impediance from the preamp. Onboard active electronics provide an ideal, constant load on the element, providing a much more sensitive response. This translates to much higher output as compared to a dynamic ribbon mic, allowing the use of any standard preamp, without concern about “impedance matching” controls. Like the R-122, the so-called “amplifier circuit” in the SF-24 actually reduces the gain coming from the step-up transformers attached to the two ribbon transducers. The active circuitry performs impedance conversion only, and its output is transformerless. The resulting self-noise is 18dBA. 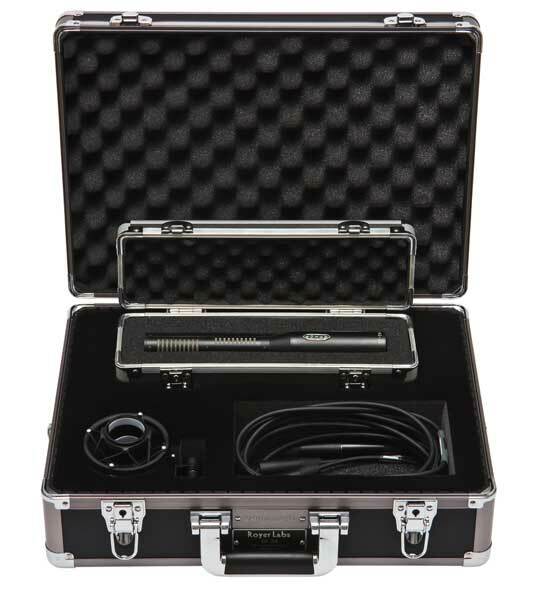 The SF-24 ships with an elastic shockmount, a padded storage case for the mic, and a padded flightcase to store the mic, shockmount, and XLR5F-to-dual-XLR3M breakout cable. The Royer Labs SF-24 is also known as: SF24. Frequency Response - BlumleinClick Graph to Compare!